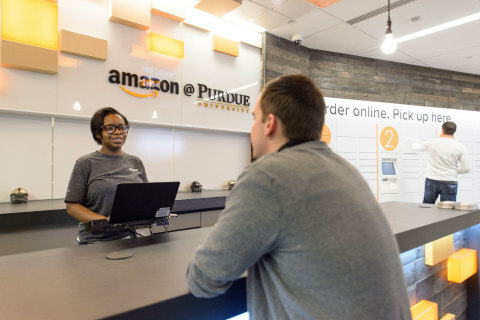 SEATTLE & WEST LAFAYETTE, Ind.--(BUSINESS WIRE)--(NASDAQ: AMZN)–Amazon announced today the grand opening of Amazon@Purdue, its first-ever staffed customer order pickup and drop-off location, housed in the Krach Leadership Center at Purdue University’s West Lafayette, Ind. campus. Purdue students now have a new convenient option for receiving textbooks and other college essentials, all with the same great prices they find every day on Amazon, as well as a hassle-free way to return textbook rentals and other orders. Additionally, Amazon Student and Amazon Prime members at Purdue get Free One-Day Shipping on textbooks shipped to the West Lafayette campus area and are also eligible for Free One-Day Pickup on over one million items when shipped to the new Amazon@Purdue location.